Barcelona and Manchester United are set to battle it out in the UEFA Champions League quarter-final second leg tonight at Nou Camp and the Blaugrana manager has revealed his approach going into the game, during his pre-match press conference. 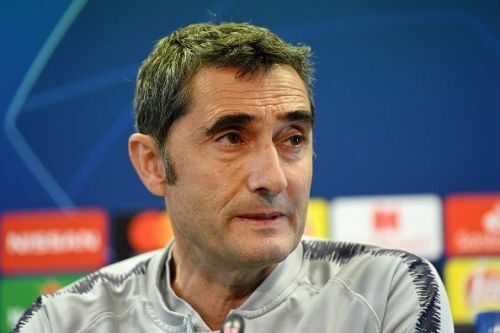 Barcelona hasn't progressed past the quarter-finals stage of the UEFA Champions League in the past three seasons and the pressure is immense on Valverde to deliver, especially since the La Liga is considered to be already in the bag. The defending Spanish champions are 9 points clear at the top of the La Liga table, with only 6 games to go. During the pre-match presser, Valverde was insistent that Barcelona are going out to press their advantage rather than sit back and defend their narrow 1-0 lead. The former Athletic Bilbao boss was also wary of the fighting spirit embodied by Ole Gunnar Solskjaer's Red Devils.